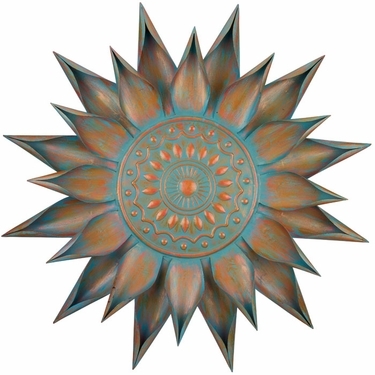 Nothing adds bold style to your garden, meditation area or other space like our 34-inch Patina Bloom Wall Decor does. This eye-catching wall hanging features an antiqued patina on its spectacular spikes, which makes it a wonderful addition when you want to add glamour and pizzazz to your walls. Our 34" Patina Bloom features a gorgeously symmetrical pattern inside and out, and the large leaves on this desert floral decor are curled to create perfect points! You'll love having this pretty wall hanging in your space; it's just right for putting a splash of style wherever you need it!